With so many car speaker options out there, how do you know what’s right for you? If you’re in the market for a 5-inch car speaker, this is the guide for you! Whether you’re looking for an affordable speaker option or maximizing your sound system, our guide gives you everything you need to make the right choice for you and your car. Choosing the right speaker for your needs can seem like an overwhelming task. By comparing different options side by side, we can help make your choice easier. Keep reading to see our top choices for 5-inch car speakers! 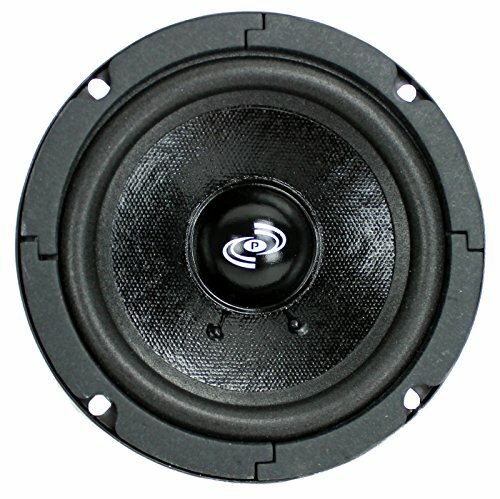 How do I choose the right speaker system for my vehicle? Are these speakers easy to install? Can these be used for non-vehicle purposes? Why do you recommend the speakers on this list? Price vs. Quality – which is better? How do I purchase one of these speakers? One of the top 5-inch speaker choices on the market today is the American Bass Sealed Basket Speaker, and it comes in as our top choice. The 10-ounce magnet and lightweight 2.2-pound design produces clear, quality sound that everyone will enjoy. 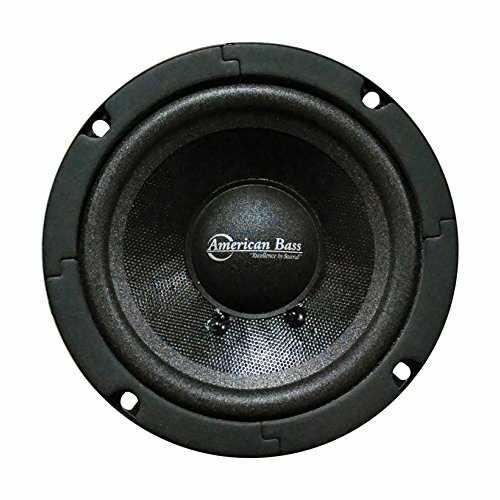 If you’re looking for a high-quality speaker that looks great and won’t break the bank, the American Bass Midrange Sealed Basket speaker is the speaker for you. The enclosed sealed basket hides the coils and creates a seal that amplifies sound and maximizes output. While it is somewhat more expensive than other units it is well worth the price. This fantastic speaker features a 5-inch midrange driver, great Impedance, and a state of the art voice coil for improved fatigue resistance, all with easy installation. It provides incredible sound quality at an ideal price. For the best 5-inch speaker on the market, check this one out today! The Earthquake Sound Machine is another great option if you’re looking for something high-quality that isn’t too expensive. When you purchase number two on our list, you’re actually getting a great option for a complete audio overhaul of your vehicle at a fantastic price. We really love these speakers, and there’s a reason why it comes in so high on our list. The ultra-durable build and quality speaker technology make these speakers a must-have for any audio enthusiast. This bundled pair is a great way to completely revamp your vehicle audio. We also love these speakers’ versatility – they can be adapted into a vehicle speaker system or can be used for a wide range of other audio applications. If you’re looking for high-end audio in an incredibly durable build, this is the speaker system you need! As one of the most affordable speaker options on our top list of 5-inch car speakers, the Pyle 5-Inch Woofer Driver really packs a punch and is a fantastic deal for the money! Featuring 450Hz to 7kHz frequency response and a solid 1-inch aluminum voice coil, this speaker is incredibly high-quality and provides fantastic sound. 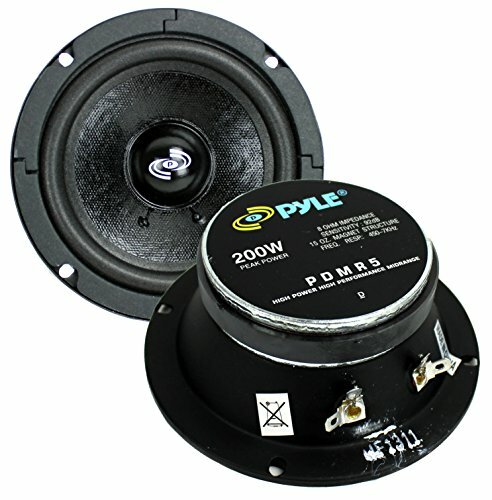 Pyle is a company with three decades of experience in creating some of the highest-quality speaker products on the market today – we love their products and recommend them for their quality products that are long-lasting and affordable. This is a very solid product that would make for a fantastic entry-level sound system. If you’re just getting into learning about car audio systems and want to test out various models, this is a great place to start. You’re getting solid sound and performance without a large investment up front. We weren’t joking when we said we love recommending Pyle products, and the next on our list is one of the best that Pyle has to offer. The Pyle Pro PDMR5 comes in a pair of speakers that are incredibly affordable for what you’re getting. You’re getting the years of experience and passion that go into each and every Pyle product for a fantastic price. Both Pyle models on our list are incredible for entry-level audio units. You’re getting a good 5-inch speaker with the PDMR5 that definitely will stay within your budget. You’ll notice quality craftsmanship and an incredible attention to detail with this Pyle PDMR5. With a maximum power output of 200W per speaker, these speakers can handle most loudspeaker needs, although any speaker can be blown so always test out your speakers to see what they can handle to avoid blowing them out. Overall, this is a good choice for something cheap and effective. 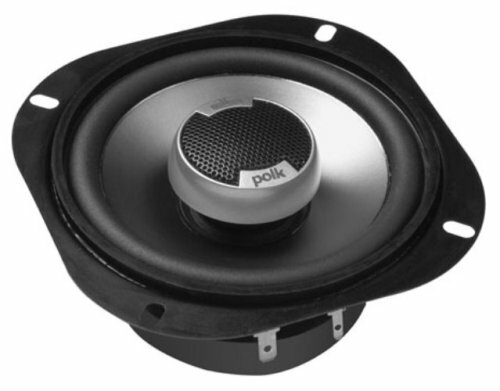 One of the more expensive options on our list, the Polk Audio DB501 Coaxial Speakers are very versatile speakers that are commonly used in boats as well as cars. The sound quality and build are some of the best on the market – the reason we put them lower on our list is the price, as well as sizing issues. We recommend doing thorough research to make sure this one will fit the space you’re looking to use it in – if you know it will, this is a fantastic option for a high-end speaker system for your car. The very durably butyl rubber casing is long-lasting and durable, able to stand up to virtually anything. When you purchase this speaker system, you can be sure that it’s going to last a long time. While on the higher end of the price scale for our list, if it’s going to fit in your space, it is well worth the price. It produces great sound with maximum input power at 135W and a dynamic balance composite cone. Rounding out our list of the best 5-inch car speakers is the Rockford Fosgate Power T152. This unit is the most expensive on the list, which is the main reason why it comes in last on our list – however, if price is not a concern, this is one of the best speaker units that you can buy today. Rockford Fosgate has over 30 years of experience producing high-end audio products, and you’re getting a very high-end unit with the Power T152. The insane frequency response range of 65Hz to 22kHz makes these speakers incredible for any use – you’ll really notice the difference between these and your stock vehicle speakers! Rockford Fosgate understands that this is not the most affordable speaker system on the market, which is why they offer budget models such as the Punch P152 and the Prime R152. You’re going to get a very solid speaker no matter what Rockford Fosgate you choose, but we definitely recommend the Power T152. We get this question all the time, which is why we try to provide as much information as possible about the options out there. As you can see, there are plenty of 5-inch speakers available to purchase, and these are just a few of the top models on the market today. If you’re going to invest the time and money into purchasing and installing a new speaker system for your vehicle, you’ll want to make sure that you’re purchasing quality speakers. Speakers that last and provide high-quality sound are two very important factors when you’re looking to upgrade your sound system in your car. Don’t always go with the cheapest option – you may want to increase your budget to get just what you’re looking for. Everyone has a budget, and understanding the price range for quality 5-inch speakers can help give you realistic expectations of what kind of speakers are in your budget. If you’re wanting the highest-quality speakers out there, that doesn’t mean that you have to break the bank. Sometimes the best speaker for your needs and your vehicle can actually save you money – doing your research ahead of time is important. Understanding speaker compatibility is the most important factor when purchasing new speakers for your vehicle. 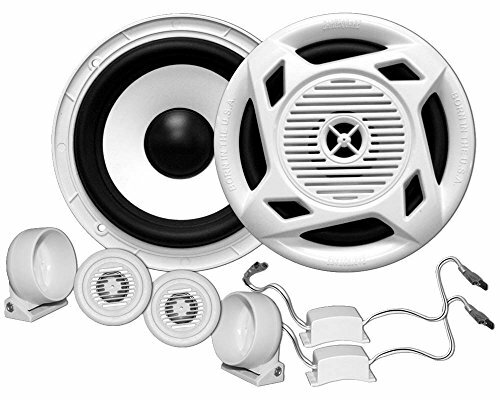 There are countless speaker sizes and setups that are available, and you can save a lot of time and headache by understanding the specifications that your vehicle needs. We recommend a professional installation service to avoid any issues with your new speakers, but if you’re confident and comfortable with vehicle electronics, these speakers are relatively easy to install in your vehicle! Our list does include some speakers that can be used outside of the vehicle, such as on a boat – if you have another application, always be sure to check the product specifications on the Amazon page to make sure it will work with your project. We understand what makes a top-quality car speaker, and we recommend the top speakers available today. No matter what your budget, we have a high-end speaker on this list for you! Trust the experts – we only recommend the best! That’s not a question we can answer for you, but we can answer it with you – everyone has different needs. Whether you’re looking for a simple and cost-effective speaker replacement or you’re wanting something top of the line, everyone has different priorities. Price can be better for one person, while quality may be the most important factor for another. Remember, just because a speaker is less expensive, doesn’t necessarily mean you’re sacrificing on quality. Great question! All you need to do is find that one that works for you based on our recommendations, click the product link, and purchase the speaker directly on Amazon. You get the expertise of Dig My Ride and the convenience of shopping on Amazon – it’s a win-win! We know that there are tons of fantastic 5-inch speakers out there for your car, and these are just a few of the top products on the market. We’ve hand-picked these as the best options whether you’re looking for a budget-friendly option or a high-end speaker system. Featuring state of the art technology and durable builds, the units on this list are all great choices depending on what you need for your vehicle. We hope that you’ve enjoyed reading our extensive guide on the best 5-inch car speakers and that our advice is able to help you make a decision – check back frequently for more interesting guides and articles to get the most out of your garage!